Apple released updated drivers for AirPort and AirPort Extreme to correct three security flaws in the old driver. They also announced that Boot Camp doesn't yet support VGA or mini-DVI adapters on the MacBook. Clever idea of the week: Cool Feet, feet that stick to your 'Book with suction cups to improve airflow and reduce heat buildup. TechRestore has flat rate screen replacement for 12", 15", and 17" PowerBooks - even with overnight service for those in a hurry. And FastMac has the fastest DVD-burner for 'Books, a slim unit that can burn DVDs at up to 8x and includes dual-layer support. "Apple Computer has shipped a critical AirPort update to correct a trio of security flaws that put WiFi-enabled Mac systems at risk of code execution attacks. "The patch comes almost two months after the public disclosure of the threat at the Black Hat Briefings and brings an end to a raging controversy over claims by two security researchers that Apple's MacBook was vulnerable to the flaw." "...as I launched each program to make sure it was running, I discovered - to my horror - that my Encyclopedia Britannica 2006 software would not launch. Upon going to the Britannica Tech Support site, I found an article titled, 'Intel-Mac Compatibility Issue.' Evidently none of the current Britannica software will work on Intel-based Macs because of 'an unsupported third-party plug-in that the Britannica application depends upon for rendering articles.' Not only will it not work, but they say they aren't going to fix it in the current versions: 'At this time, there are no plans to patch any current or past versions of Britannica, although we hope to be able to certify our 2007 software with Apple's new Universal compatibility standard ( http://www.apple.com/universal/ ).'" "Greenpeace has launched a major action against IT/computer manufacturer for some times already. They have asked an independent Danish laboratory to perform toxicological test on several notebooks. "Those tests have identified numerous toxic compounds, in large amount in HP notebook but also in MacBook. According to the analysis, customer-dedicated Apple notebook model is massively contaminated with tetrabromobisphenol A. This compound is widely used and incorporated in polymers as a reactive or additive flame retardant." "Roll-up laptop displays and keyboards for more portable computing are just two of the proposed applications for a new 'shape shifting' technology for solid structures developed at Cambridge University. "According to Keith Seffen, an engineering lecturer at the university, "morphing" structures can be used to produce more flexible configurations for hard materials like metals without using complex parts or manufacturing processes. "A specific area of interest is improving the portability of computer technology and to this end the team has mocked up an A5-sized flat display screen which can lock into the shape of a tube so it can be placed in a briefcase or pocket." "With Boot Camp Beta 1.1 and Windows XP, VGA adapters are not supported, even if they work in Mac OS X. For example, you cannot use displays, projectors, or TV output devices if they require a VGA adapter. "Video output over Mini-DVI adapters for MacBook computers, or DVI-to-VGA adapters for MacBook Pro computers, is also not supported even if it works in Mac OS X." PR: BlueLounge Design has released of Cool Feet, suction-cup attached laptop computer feet that elevate the machine from the work surface to improve ventilation and cooling. Each Cool Feet package comes with two tall feet, two short feet, four circular adhesive plates and a carrying pouch, and sells for $12.95. The feet can be popped off easily for travel. Three position options are suggested - using both sets of feet, short in front and tall in back, using the tall feet in the back only for a steeper angle, or using the short feet in the back only. Not suggested, but there's no reason why it would not work for negative rake with just the short feet in front. You can use the Cool Feet on your lap as well. PR: Has your screen gone dark, or has a fall damaged your MacBook, PowerBook or iBook LCD screen? TechRestore now offers an Overnight flat-rate LCD Screen Replacement for MacBooks for $399, for MacBook Pro 15.4" for $499 and for MacBook Pro 17-inch for $699, which I'm sure will beat whatever Apple charges for screen replacements when these machines are out of warranty. The TechRestore prices include a brand new LCD screen, installation, and a 1-year warranty. TechRestore say they realized that due to the high volume of repairs they perform and their Technician's expertise, that they could offer a complete repair service for the same price (or less) that the no-frills parts companies were selling just the screen for. Flat-rate LCD screen repairs are also available for PowerBooks and iBooks. Complete your order online, or call 1-888-64-Restore (888-647-3786) to schedule your repair via phone. Choose from Overnight Door-to-Door courier service or send your laptop to us on your own and get return overnight shipping back to you. TechRestore will install a new replacement LCD screen within 24-hours and then send your laptop back to you via Overnight courier. You have the choice of having them pickup your Laptop at your door for an additional $49, or you can send it in via your preferred method and they'll include overnight return delivery for $19 when your screen repair is complete. If you select the Overnight Pickup Option below, once you schedule your repair, TechRestore will dispatch a RestoreBox to your location in the continental U.S. via overnight courier (home, office, school, you name it) to pickup your Laptop for a return overnight trip back to TechRestore, who will receive your system the following day (M-F), install your new screen within 24-hours and then send your Laptop back to you overnight. The replacement screens are new, not refurbished. There are no additional charges for cracked or broken screens. PR: FastMac has announced the availability of a new internal slimline slot-loading 8x Dual Layer SuperDrive upgrade for PowerBook G4 (Titanium and Aluminum), iMac G5, iMac Intel, Mac Mini Intel, iBook G4, PowerMac G4 Cube, PowerBook G3 (Lombard and Pismo), and iMac G3 Slot-Loading systems. The drive adds Dual Layer DVD-R (4x) support (previously unavailable at any speed) as well as faster DVD-RW (6x), DVD+RW (8x), and Dual Layer DVD+R (4x) write speeds, up to two times faster than Apple's top-of-the-line slimline SuperDrives. It is the most functional and most complete slimline SuperDrive available for the Mac. The upgrade is available now for most models at an introductory price of $119.95. It comes with a 1-year warranty and 30-day money back guaranty. PR: Mobile computing finally realizes its full potential with the recent marriage between Apple Computer and the Intel Core Duo processor. As industry heavyweights forge a new partnership, the move ultimately positions the MacBook Pro as a cornerstone in today's mobile office. Built-in Bluetooth connectivity plus Apple's AirPort Extreme let mobile professionals disconnect from their tethered existence, and external battery technology provides an additional 6+ hours of runtime between charges. At the helm of this mobile office, Mac OS X effortlessly manages the new Intel Core Duo processor for robust performance that matches desktop power. Intensive tasks like digital media editing are split between two computation cores for maximum efficiency. With the MacBook Pro, mobile professionals can touch up images on the latest version of Aperture or review daily footage in Final Cut Studio on the fly. Taking cues from the iPod, the MacBook's sleek design and innovative ergonomics make work feel more like play. The built-in iSight camera facilitates quick and easy podcasting and video conferencing. Multimedia presentations flow smoothly with the Apple Remote, while the MagSafe power adapter prevents stumbles in the event a cord gets in the way. Until now, the mobile office has struggled to go completely wireless. The predominance of WiFi networks has severed network cables, however mediocre laptop batteries force mobile users to find an outlet and recharge every couple of hours. The mobile electronics industry has largely ignored battery capacity in favor of smaller devices packed with more features. In contrast, a high tech startup company from Oregon's Silicon Forest has tackled and successfully developed the world's first and only external battery for the MacBook family of computers. The new Portable Power Station by Battery Geek, Inc. supplies an additional 6+ hours of mobile computing time for the MacBook Pro, and incidentally supports most Windows based laptops as well. With a massive 140 watt-hour capacity spawned from premium grade Li-ion cells, the Portable Power Station provides a reliable power source to support a demanding mobile office. Sean M. Murray, USMC veteran and founder and CEO of Battery Geek, Inc. explains, "The Portable Power Station legitimizes the concept of a true mobile office. It powers devices from 3 to 28 volts making it the most versatile external battery on the market today." 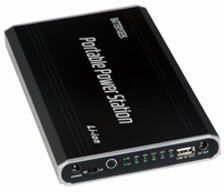 As mobile professionals rarely travel without a mobile phone, PDA or iPod, the Portable Power Station doubles as a battery backup for these handheld devices. Connect through the USB charge port, and the Portable Power Station recharges virtually any USB device. Its sophisticated electronic control system regulates output power, and integrated sensors monitor the battery to prevent overheating and failure. Designed as a MacBook companion, the Portable Power Station is roughly half the size of the 13" MacBook and weighs less than 2 pounds. The shock resistant aluminum shell protects the battery from damage, and its compact profile slides conveniently inside a laptop case. Melissa A. Bostick, co-founder and CFO adds, "International travelers are especially excited by the Portable Power Station's flexibility. They are working through long flights, and watching multiple movies on their portable DVD players and iPods during layovers." Consumers seeking more information regarding Battery Geek's newest product, the 140Wh Portable Power Station, are invited to visit the company's website and use an online form to request a free battery audit to help them determine the best power solution for their laptop, cell phone, portable DVD player, or other mobile device. PR: Laptops For Less, an industry expert and leading online supplier of mobile power products, today offered some buying tips regarding the choice between compatible laptop batteries and OEM laptop batteries. In the world of laptop batteries there are two different categories. The first is OEM (Original Equipment Manufacturer) also known as a brand name battery. These are laptop batteries that are sold by the manufacturers (i.e. Dell, Sony, Compaq, Apple, etc.) and carry warranties under such companies. The second type of battery is known as a compatible battery. These are batteries that are compatible with the OEM batteries, and in most cases contain the identical power cells, but are made by a company other than the original manufacturer. Even though compatible laptop batteries are not stamped with a brand name like Apple on them, they are in fact more similar to OEM batteries than most people realize. Despite carrying the manufacturer's name, most OEM laptop batteries are not manufactured by the companies themselves. In most cases, the OEM batteries are built by a different company and then sold by that company to the manufacturer who then brands the battery with their name. For example, the recent Apple laptop battery recall revealed that the power cells inside Apple laptop batteries were produced by Sony. Therefore, when you purchase an Apple laptop battery you are really purchasing a Sony battery in an Apple casing. In these cases purchasing a name brand does not necessarily guarantee superior quality. Other times the manufacturer of the laptop battery or the power cells might be a so-called generic company that then sells their product to a large company (i.e. Dell, Sony, Compaq, Apple, etc.) who brands the battery with their name. In these instances the battery is literally identical to a compatible battery, except that the compatible battery maintains the generic name and can therefore be sold at a significantly reduced price. Compatible laptop battery manufacturers simply cut out the middle man and instead of selling the battery to Apple who then sells in to the consumer they sell them directly to the consumer. Eliminating the middle man and the brand name allows the compatible compatible laptop battery to be sold for significantly less money than the OEM batteries - in some cases the consumer could save up to 70%. In addition to the savings advantage of purchasing a compatible battery, most consumers find that compatible, or generic, laptop batteries outperform OEM batteries. This is due to the fact that the generic brands know that consumers tend to be skeptical with their first generic battery purchase and therefore their product must perform superiorly in order to maintain a customer base. About Laptops For Less - since 1996, Laptops For Less has been the leading provider of compatible laptop batteries and other portable electronic power supplies. As an industry leader Laptops For Less delivers high quality laptop parts and PDA accessories with a high level of service. Their unique product lines of over 1,000 diverse accessory products and replacement parts provide customers with an extensive selection of the best quality products available. PR: MiniBatteryLogger monitors your laptop's battery, traces the graph of charge over time, logs relevant power events, and alerts you with Growl notifications. User can now manually add or remove battery snapshots. Fixed bug: automatic snapshot visible only after restart. System requirements: Mac OS X 10.4 or later, laptop.